FILE - Eritrea's President Isaias Afwerki and Ethiopia's Prime Minister Abiy Ahmed arrive for an inauguration ceremony marking the reopening of the Eritrean embassy in Addis Ababa, Ethiopia, July 16, 2018. The leaders of Ethiopia and Eritrea reopened crossing points on their shared border for the first time in 20 years on Tuesday, cementing a stunning reconciliation and giving Addis Ababa a direct route to its former foe's Red Sea ports. "We heralded the new year by demolishing the trenches along our border," Abiy told reporters, referring to the fact that Ethiopian New Year was celebrated on Tuesday. "As of today, Ethiopia's defense forces [along the border with Eritrea] will be gathered to camps and ease tension that was often extreme. The same will be done from the Eritrean side." Tensions burned on over the position of the frontier — until Abiy offered to end the military standoff this year as part of a package of reforms that have reshaped the political landscape in the Horn of Africa and beyond. 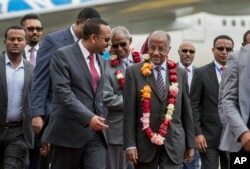 FILE - Eritrea's Foreign Minister Osman Sale, center right, is welcomed by Ethiopia's Prime Minister Abiy Ahmed, center left, upon the Eritrean delegation's arrival at the airport in Addis Ababa, Ethiopia, June 26, 2018. Soldiers and civilians waving Ethiopian and Eritrean flags lined the road as Abiy and Eritrean President Isaias Afwerki opened the frontier in a ceremony broadcast live on Ethiopian state TV. "This is the happiest day of my life," Ruta Haddis, an Eritrean from the town of Senafe just across the frontier, told reporters. "I never thought this would take place in my lifetime." The two leaders opened another frontier crossing at Bure, Eritrea's Information Minister Yemane Meskel said in a tweet. The Debay Sima-Bure crossing leads to the port of Assab in Eritrea's east, while its Massawa port is directly north of the Serha-Zalambessa connection. Pictures posted online by Abiy's chief of staff showed the leaders talking and walking side by side in Bure — Abiy in camouflaged military fatigues and Isaias wearing sandals and a safari suit. The two leaders also celebrated Ethiopian New Year together at the border with their troops on Tuesday, Abiy's chief of staff, Fitsum Arega, said. Ethiopia follows a calendar similar to the ancient Julian one — which started disappearing from the West in the 16th century — meaning the country entered its year 2011 on Tuesday.